Come & Enjoy the Best Sunsets in Key Largo... ... while you dine in the island atmosphere of the Bayside Grille. With it's all-glass panoramic view of the water and it's open kitchen, the restaurant is a waterfront extravaganza that you must not miss while living or visiting in Key Largo - the first of the Fabulous Florida Keys. As you stroll behind Café Largo towards the bay, you will find Bayside Grille: an elevated, open-air dining experience. It's bistro-style dining room features an expansive view of the Florida Bay and it's sunsets. Daily lunch, dinner and wine specials highlight a creative menu. A the Bayside Grille, the unique Sunday Brunch on the water's edge has become a local's favorite... A FAMILY TRADITION of restaurants Over the past 50 years, there have have been a number of restaurants in South Florida that have been owned and operated by both the DiGiorgio and the Maiani families, and by various relatives. Living in South Florida, the DiGiorgios soon discovered Key Largo and fell in love with the people and what the area had to offer. offer. By 1991, the DiGiorgios had permanently moved to Key Largo, purchased the waterfront property of B & G Goodyear Automotive at Sunset Cove on Florida Bay, and turned it into Café Largo. The Bayside Grille is a reality But after opening the Café in 1992, it didn’t take long for the family to realize there were many requests for waterfront dining. The Bayside Grille was built from the ground up, at the water’s edge, directly behind Café Largo, and opened for business in 1996. With all the restaurant experience in the family, this was a chance to diversify menus and get creative. And that's exactly what they did. During the course of the past 10 years, Bayside Grille has become well known for its Menu, View, Quality & Consistency. The Grille is hands-on, family-run operation. As a result, the DiGiorgios take particular, personal pride in the quality each and every meal that they present to you, their guests. 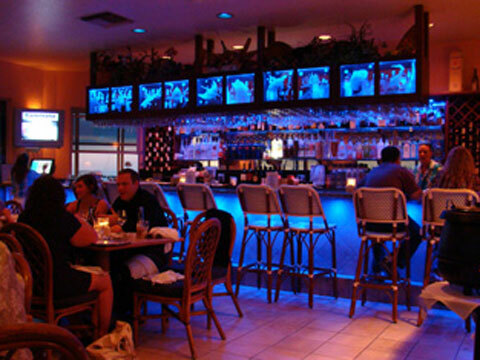 We, the DiGiorgios, invite you to experience our Grille overlooking the beautiful Florida Bay. Only the finest... At the Bayside Grille, we strive to make every meal an event for you and your family by sharing with you: Our Sunset The Grille is set at the water’s edge on Florida Bay at Sunset Cove. The dining room is elevated 15 ft to give you a bird’s-eye view of the bay with all of its activity. Our Commitment to Quality Cuisine As a family business, we know that the quality of our cuisine is a direct, and personal reflection on our family. As a result, we maintain quality & consistency by using only the finest gourmet products in our kitchen, and creating exceptional meals with them that are tried and true. Exceptional Seafood, Meats & Spices Our White Water Clams are farm-rised in Florida, and we procure the rest of our seafood daily from the Key Largo Fisheries (across the street): · Yellowtail, Dolphin (Mahi-Mahi) & Tuna · Florida Lobster, Stone Crab & Conch All our meats are hand-cut & butchered daily in our kitchen. We offer guests "Certified Angus Beef," and are THE ONLY RESTAURANT IN KEY LARGO TO DO SO. To prepare our Island Cuisine correctly, we rely on R.L. Schreiber to provide us with the variety of fresh produce, freshly-squeezed juices (for marinades), and specialty herbs & spices (a multitude) that are necessary.